Commemorating the sacrifice of Imam Hussain (A.S), Youm -e-Ashura, the tenth day of the Muharram was observed with solemnity on September 20. Showing solidarity, thousands of Shias took part in the procession with an amid cries of ‘Ya Hussain’, reciting Noha Khwani and beating their chest. Muharram marks the holy day of Ashura. Imam Hussain Ali, the grandson of the Prophet Muhammad was killed on this day during the battle of Karbala by the soldiers of the Caliph Yazid in 680 AD. The death of Imam al-Hussein is considered by the Shia community as a symbol of humanity’s struggle against injustice, cruelty, and oppression. 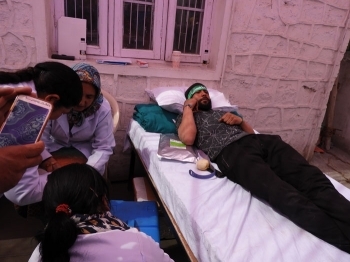 Anjuman Imamia Youth wing under the banner of Alamdar Health services also organised a blood bank camp in the main market. Advocate Muzaffar Hussain Barcha, President, Anjuman Imamia Youth Wing Leh talked about Alamdar health services and the importance of blood donation camp on the day of Muharram. He said, “We are trying to save lives of the people by donating blood in time of need. This is one such way to walk on the path led by Imam Hussain for the humanity cause”. Reiterating the land allotment for the construction of Imam Hussain blood bank, he said that the request is kept pending from many years by the Hill Council. Sayeeda Ladakhi, Nominated Councillor applauded the Alamdar Health services for organising the blood camp and helping many needy patients. Expressing sadness over the non-fulfillment of their long pending demands of land allotment, she said the issue will be raised in the upcoming General Council Meeting. “The land is not for personal benefit but to establish an organization who helps the society irrespective of different faiths and caste”, she added. Ashraf Ali Barcha, President, Anjuman Imamia expressed the importance of following the message of Imam Hussain in our life for the greater humanity cause and harmony among each other. The blood donation camp has been organised for many years and is helping many patients in need of blood. “To keep it continuous for a longer run we demanded a piece of land but sadly, no positive response is seen. The Hill Council, Leh is turning away when it comes to supporting the people who are doing a noble cause for the society. We are ashamed of raising our demand every now and then”, he added. Dr. Abdul Qayum, President, Anjuman Moin-ul Islam; Farooq Qaiser, ASP; Swami Vishwanand from Rajkot, Gujarat and Shaikh Nazir Ahmed Sharifi, President Majilis Ulema Leh also spoke on the occasion.